As the old saying goes, to the victor goes the spoils. After one of the biggest victories in program history, the Pitt football team is still reaping the benefits. 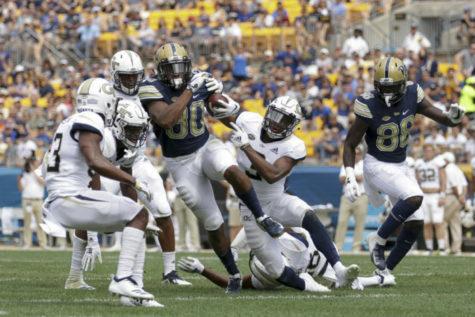 Panthers quarterback Nathan Peterman, running back James Conner, linebacker Matt Galambos, defensive end Ejuan Price, kicker Chris Blewitt and even head coach Pat Narduzzi have been showered with accolades since the conclusion of Pitt’s thrilling 43-42 win over the No. 2 Clemson Tigers. With so many of Pitt’s players being rewarded for their efforts, the Bobby Dodd Coach of the Year Foundation, in affiliation with the Chick-fil-A Peach Bowl, made sure Narduzzi’s leadership didn’t go unnoticed. On Monday, Narduzzi picked up the Dodd Trophy Coach of the Week award, which honors football coaches whose programs embody scholarship, leadership and integrity, while also creating success on the football field the previous week. Peterman received multiple honors on Monday, taking home both the ACC Offensive Back of the Week award and the Walter Camp National Offensive Player of the Week award for his remarkable performance in steering Pitt’s offense to a dramatic upset over the previously undefeated Tigers. Clemson’s dominant defense came into the game ranked No. 8 in the country in scoring defense, allowing only 15.7 points per game. While the Tigers’ defense had allowed a total of five touchdown passes all season entering the matchup, Peterman torched them for a career-high 308 yards and five touchdowns without an interception. But Peterman’s most important contribution may not have been one of those five scoring passes. The graduate transfer quarterback engineered a five-play, 34-yard drive in the final minute to set up Blewitt’s game-winning 48-yard field goal. The kick earned Blewitt ACC Specialist of the Week honors for the second time this season and fourth time in his career. Along with his 31-yarder to beat Georgia Tech on Oct. 8, the senior now has two game-winning field goals this season and five for his career. Narduzzi declared Galambos the Pitt coaches’ selection for the team’s defensive player of the game in the win over Clemson — and it seems the ACC agreed, naming the senior linebacker as the conference’s Co-Linebacker of the Week. Galambos made a team-high 12 total tackles in the game, none more critical than his fourth-and-1 stop on Tigers running back Wayne Gallman to give the ball back to the Panthers with 58 seconds left in the game. This is his third time taking home an ACC weekly award. On Tuesday, a pair of Panthers who went unrecognized on Monday received their own national honors, as Conner and Price became two of the 20 national finalists for the 2016 Rotary Lombardi Award. Eligibility for the Lombardi Award, previously presented by the Rotary Club of Houston to the nation’s top linebacker or lineman, expanded in 2016 to include all players who demonstrate outstanding performance and best exemplify the discipline, virtue and wisdom displayed by legendary head coach Vince Lombardi. 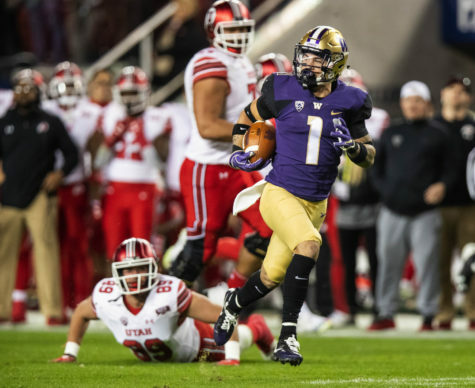 Voting conducted by select Football Bowl Subdivision head coaches and college football media from across the country narrowed the list to 20 players. 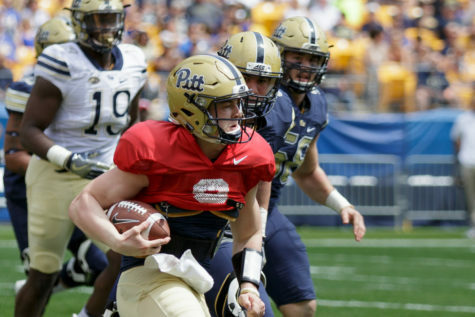 After overcoming both a torn MCL and Hodgkin’s lymphoma in the past year to meet his goal of playing in Pitt’s season opener Sept. 3. vs. Villanova, Conner has shown no signs of being slowed down or adversely affected by his injury or illness. The redshirt junior running back has rushed for 844 yards and 12 touchdowns on 175 carries while adding 18 receptions for 254 yards and three additional scores. His 15 total touchdowns rank second in the ACC and ninth in the NCAA, and he now has 51 for his career, one short of the ACC record. 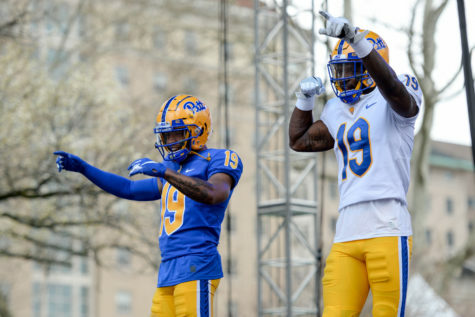 But Conner may have saved his best game of the season for Pitt’s toughest opponent. The former All-American tailback racked up 132 yards and a touchdown on 20 carries along with three catches for 57 yards and another score. His 20-yard touchdown run, punctuated by a hellacious stiff arm, brought the Panthers within two points with just over five minutes left. “That was probably the best run I’ve ever seen in my life,” Peterman said after the game. Price, a sixth-year senior, got off to a ferocious start to the 2016 season, leading the nation in sacks and tackles for loss much of the way. Injuries to the rest of the Panthers’ defensive line have allowed teams to focus on blocking Price, but he is still on pace for a tremendous season. He ranks seventh nationally with 16 tackles for loss and ranks No. 12 with nine sacks.